PLANT: Shrub, slender, spreading, weakly armed, 1-4 m tall. STEMS: brown to gray-brown, branching becoming very dense with age, pubescent when young, glabrescent with age. LEAVES: stipules black to brown; petioles pubescent, 1-2 mm long; blade 8-15( -30) mm long, 4-11( -18) mm wide, thin, shiny green, villous, pinnatelyveined, entire to serrate, woolly when young, soon glabrous; midvein prominent beneath. FLOWERS: minute; hypanthium 1.2-1.8 mm diameter; sepals yellowish green; petals creamy white to yellow, ca. 0.5 mm long. FRUITS: flattened, star-shaped, the floral cup persisting on proximal end of fruit. NOTES: Dry rocky canyons and hillsides, desert grassland and sw oak woodlands: Cochise, Gila, Graham, Greenlee, Maricopa, Navajo, Pima, Pinal, Santa Cruz cos.; 900-1525 m (3000 - 5000 ft); Mar -Sep; NM, Trans-Pecos region TX; Son. to Jal., Mex. 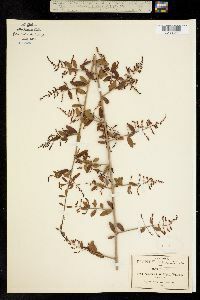 Some branches have opposite to subopposite slender thorns, whereas others may be more leafy and less thorny. Leaf margins vary within an individual from entire to serrate. 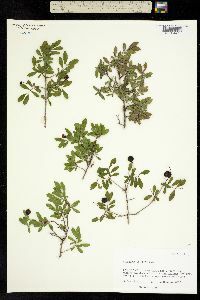 Leaves are larger and more numerous on plants in riparian areas and dry washes. 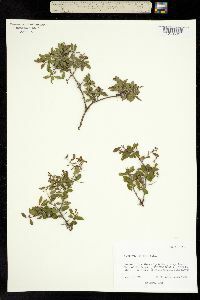 In some instances Sageretia wrightii has been confused with Colubrina californica, however, the leaves of Sageretia wrightii are shiny green and thin, whereas the leaves of Colubrina californica are thicker and dull gray-green to yellowish green. The fruits of C. californica are woody capsules whereas the fruits of S. wrightti are fleshy drupes. 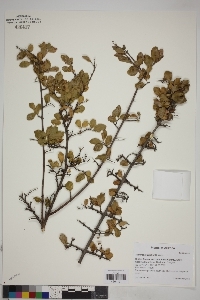 REFERENCES: Kyle Christie, Michael Currie, Laura Smith Davis, Mar-Elise Hill, Suzanne Neal, and Tina Ayers, 2006 Vascular Plants of Arizona: Rhamnaceae. CANOTIA 2(1): 23-46.